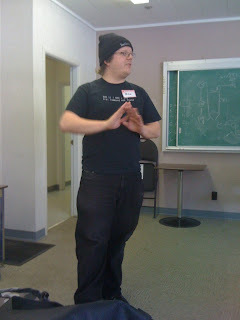 I want to share some thoughts on promoting speeches at Toastmasters clubs. Toastmasters Speeches are a bit of a passion of mine - I've been Vice President of Education (VPE) many times and when I traveled around to clubs it always was a hot topic that people were looking for advice on. I should comment as well that I have strong feelings and opinions. I am not meaning to sound like I'm representing any particular Toastmasters club, the District in general or Toastmasters International as an organization. My thoughts are my own, OK? That's a simple statement with profound implications. Let me share some scenarios with you. SCENE 1 - A Toastmasters club. The crusty old VPE is telling people they should be delivering speeches for the Distinguished Club Program (DCP) again. There haven't been any speeches in the last couple weeks. Someone snidely points out that the club doesn't get any DCP points because their membership is too low. You note that you can't remember the VPE ever having done a speech themselves. They still have an ATM-G designation - you have not ever seen them get an award. SCENE 2 - A Toastmasters club. A slightly younger VPE is telling people they should be delivering speeches. The VPE has an Advanced Communicator Bronze (AC-B). The VPE doesn't do a lot of speeches from the AC books any more - he mostly does educational sessions. Many young members are nodding along - they are already pushing hard to get through their Competent Communication (CC) manuals. The older members deliver speeches rarely. The executive is the same it was last year with a couple people swapping roles. When people finish their CC's they immediately vanish from the club. No one seems to know why. The most important thing you can do to encourage speeches is to have some credibility when you encourage people to do so. The best way to establish credibility is to do speeches yourself. In particular, publicly achieve educational awards. As an executive member I generally assume that half my membership will attend regularly. In terms of speech performance I assume that they will rise to the standard that I set at best. So if I have a 16 member club and I do 8 speeches in a year then I can expect at most 16 x 1/2 x 8 = 64 speeches over 50 weeks. And for the record, as I'm a data geek, if I pull my club statistics for 2011-2012 then I find that we did, in fact, 59 speeches. Now if I boost my performance as an individual then the club responds accordingly. So far in 2012-2013 I've roughly doubled my number of speeches YTD and thus far on 13 weeks we've had 36 speeches. It took 23 weeks in 2011-2012 to do the same. This year I'm pushing to complete a triple crown. Do you want to bet me that the club will respond accordingly? In past years where I was VPE I find the same parallel. If I'm speaking regularly, other members are as well. If I'm taking a more passive role then people tend to do the same. If I blow off speeches they do. People are inspired by your actions far more than your words, simply put. If you want more done then do more. Now the usual barriers to doing speeches are that the Advanced manuals are hard - they require preparation and setup. But in reality it is better to be doing something than nothing. Completing the CC manual allows you to stay engaged with members who are doing it themselves for the first time. In past years I've challenged younger members to try to complete their CC before I do mine which has led to some great club energy. And you can keep moving on your AC manuals - just step into the CC whenever you need a mental break. Or do a themed CC - I once saw a club president work through a CC based entirely on trains. I did a CC once done entirely impromptu. Or do one entirely scripted. The reality is that you should not be asking more of the younger members than you ask of yourself. If you tell them they should be setting a goal then do so yourself. Call upon your executive members to do the same. They are the club leaders. I have a hard time accepting that any Toastmasters member attending a regular weekly meeting cannot achieve one educational achievement per year. Celebrate your success. Put yourself out there as a leader. Take aside some members and ask for help coming up with a topic for that next speech. Even if you don't need it any more, let them be involved. Give them a rough outline and ask them how you could jazz it up. Follow up with them afterwards. Be a cheerleader. Don't ever ask them to do something that you're not doing yourself! Before you point a finger, look at yourself in the mirror first. The benefits you preach to them apply to you as well. The challenges that you face are the same ones in front of them. If you've lost the path and don't see the value any more then fix yourself first. The same advice applies to any leader trying to inspire behavior in others. Read Matthew 5:14-16. If you want people to perform then do it yourself first - be that light on a stand - and see if people don't respond.